﻿ There are a couple of downsides to iron sights. One, obviously, is low-light conditions. You can't hit what you can't see is one of the most basic rules in shooting. Another is that to shoot accurately, you have to focus on the front sight post, and at the same time be able to train that sight on your target and maintain a secondary point of focus. Biologically, our eyes can only focus on one point at a time. The target will be blurry if the eye is properly trained on the front sight. For these reasons, the advent of red dot and holographic optics has been revolutionary. You can take that further and include pointing devices such as lasers and night vision optics. With combat taking place at almost any time, any place, and with the advent of covert, search-and-destroy type ops, you can see how being functional at night is crucial. But as a recreational or competitive shooter, red dot optics offer a clear advantage for a different reason. First, let's take a look at the similarities and differences between red dot/reflex sights and holographic sights. 1. Reflex/Red Dot Optics: Most red dot optics are categorized here. The "dot" is projected from behind the glass lens and then reflects off the lens toward the shooters eye. This gives the effect of the dot "floating on the lens", meaning that even if the shooter's eye is not in the center of the sight, the dot will "move" and still be on the target. The lens only reflects the color wavelength of the dot, and allows all other colors to pass right through the glass, making the glass appear to be completely transparent, but in actuality, anything in the same wavelength as the dot would be reflected back to the shooter's eye. This, of course, is not noticeable. Top quality manufacturers tune the lens glass very carefully to make sure the sight picture is perfect. The dot or reticle is supplied with power either from a battery (i.e. Aimpoint) or other power source such as the tritium fiber-optic reticles used in Trijicon ACOG's which gathers ambient light from the environment. Another key feature, especially in combat, is that no light is transmitted forward toward the enemy, as with lasers. The only visible part of the reflex/red dot optic is the dot reflected back toward the shooter's eye. The tube-style red dots such as Aimpoints sometimes are knocked as having a limited view because of the small glass and the size of the tube body surrounding the reticle. This, however, is not really an issue if you are shooting with both eyes open. The glass is however mounted perpendicular inside the tube, so glint off the front of the optic could potentially be an issue. For this reason, kill-flash attachments are popular. 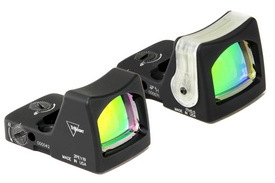 Currently, you can find reflex red dot optics in two configurations. The "tube-style" red dots typically sit in a mount raised above the bore of the rifle, and have a battery source on the top or to the side of the reticle tube. Aimpoint, Vortex, Bushnell, Trijicon, Leupold, and others feature optics with this configuration. A second type is the so-called "Heads-up" or single-lens reflex sight. These very small sights usually attach directly to a rail and are popular positioned on top of ACOG's, variable power scopes, or on offset rails such as the 45 degree rails you see on 3-Gun setups. Trijicon, C-More, and Docter are some of the more well-known manufacturers of heads-up style reflex sights. 2. Holographic Sights: You can interchange holographic sight with Eotech pretty much if you want. These are typically larger and heavier than reflex sights. They utilized a laser transmission holographic sight picture which is projected in the sight window and sandwiched between two panes of glass. (This does NOT mean it is a "Laser" sight.) The hologram is projected back toward the shooter, but is also said to be projected virtually approximately 50 yards in front of the shooter. Holographic sights such as the Eotech fall into the category of "heads-up" sights so they require a riser when mounted on AR-15 rails to get the optic up to eye level. Battery life is also somewhat of an issue, as projection of the hologram eats through batteries, so the Eotechs have a battery saving feature which shuts the hologram off after 4 or 8 hours. 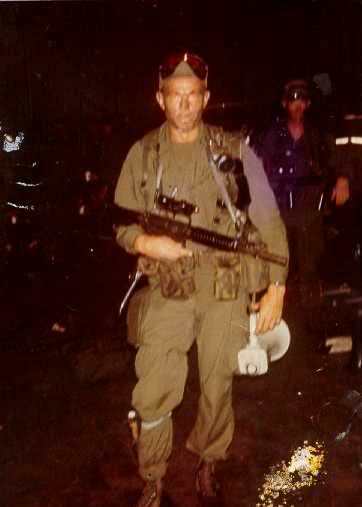 This, I think, is a distinct negative with regard to combat, as you would prefer to turn your optic on and leave it on. As a sidenote, the Eotech offers a unique reticle, the "dot-in-circle" with a 1 MOA dot inside a 65MOA circle. Many in law enforcement and the armed forces love this reticle for quick acquisition of man-size targets. One of the often-quoted advantages over tube-style red dots is the wide field of view, as the Eotech features a large, rectangular glass with a small amount of body on the outside of the glass. The big advantage of using red dot or holographic sights on AR style rifles involves the ability to shoot better in low light conditions and also to focus on the target instead of the reticle. The most proper way of utilizing rapid acquisition sights is to shoot with both eyes open, focusing on the target, and allowing the dot to sit over your target. In fact, if you focus your eyes on the dot itself, often times it will appear blurry. Proper aiming allows quicker acquisition of the target and allows you to keep your eyes downrange. Even though the technology inside each type of optic is different, their description of use and functionality are essentially the same. Personal preference comes into play quite a bit here, and trying out both types is highly recommended before tossing down the cash to get one. You can expect to spend anywhere from $200-600 for top-quality tube style and holographic sights, and close to $1000 for ACOG style optics. Needless to say, it pays to do your homework when selecting an optic. Hopefully, this clears up some of the confusion on the differences between reflex and holographic sights and allows you to make a more informed decision for your needs.